Excursion: Brand new 5 day tour! Wow! Just wow! What a tour this is. Scotland is one of the most picturesque landscapes in Europe – some might argue the world – and what better way to see it on our spectacular Grand Scottish Rail Journeys Tour. 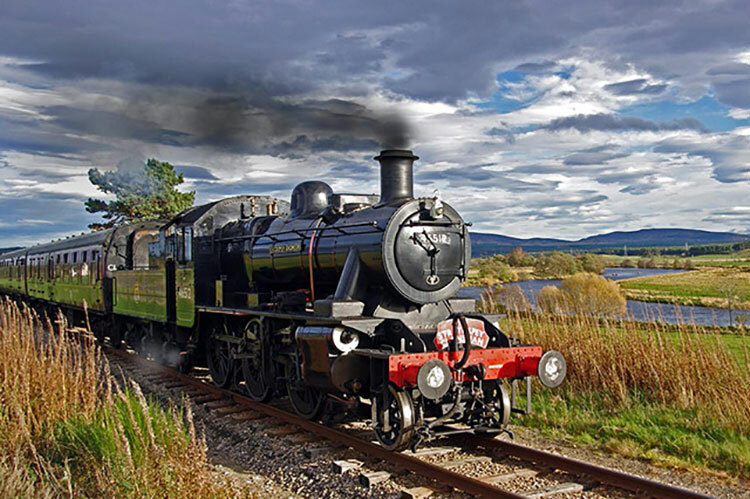 You’ll see the most spectacular scenery that Scotland has to offer, aboard some of the most wonderful and lovingly restored stream trains you’ll see anywhere in the world. As you’d expect, Burland Excursions have chosen a lovely hotel where we will base ourselves over the four-day tour, sampling some wonderful food either end of our fabulous rail journeys. Let’s cover the star of the show – the journeys themselves – before moving onto the accommodation and food. We’ll travel up to Scotland and get you settled into your hotel, where you’ll stay for the duration of your trip. The wonderful Nethybridge Hotel is situated right in the heart of the Cairngorm region, surrounded by mountains and lovely views. An early start today for a wonderful two-anda half-hour scenic journey across the “Top of Scotland”. The line meanders by the mountains, lakes and lochs into the west coast port of Kyle of Lochalsh. There’s time for lunch and to enjoy the views across to the Isle of Skye before rejoining the train for the return journey to Inverness. We join the Strathspey Railway in Aviemore for a journey to Broomhill across the heather covered moorland with a backdrop of the Cairngorms. Afterwards we take a trip to the mountains on the Cairngorm Mountain Railway, the UK’s highest railway. At the summit there’s time to make the most of the Ptarmigan Restaurant, with viewing terrace and exhibition, before we return down the mountain. Day 4 - The Jacobite Steam Train and “The Greatest Railway Journey in the World” Described as the “greatest railway journey in the world” (we don’t disagree), this 84 mile round trip takes you past a list of impressive extremes. And this aboard one of the most famous stream engines, ‘The Jacobite’. On the Mallaig line, the highlight is undoubtedly the northbound climb to Glenfinnan station across the famous viaduct, as featured in the first Harry Potter film. Set in an amphitheatre of mountains and overlooking the Glenfinnan Monument, this was erected in 1815 to mark the spot where Bonnie Prince Charlie raised his standard in 1745. All the while, we will be using the lovely Nethybridge Hotel as our Scottish Base to enjoy the rail journeys. The hotel enjoys real log and coal fires, as you’d expect in bonny Scotland. Hotel Facilities: The Abernethy Restaurant specialises in Scottish dishes using fresh produce. There is wheelchair access and room service.